Send 1 kg Sumptuous Heart Shaped Vanilla Cake to Chennai. Gifts to Chennai. Send Cakes to Chennai. Description : This heart shaped cake available on the online gift store of Gift2Chennai.com, is white in color and has the words - Love U written on top, along with colorful floral designs. The cake is vanilla in flavour, and has fresh cream on top. It is an eggless cake, and it tastes divine. 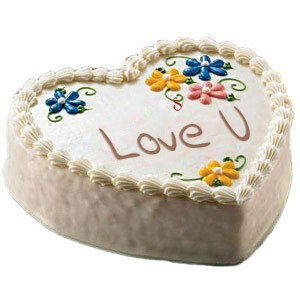 Your beloved will be delightfully surprised on receiving this cake as Valentine’s Day Gifts to Chennai. You can also avail various other gifts on our online store to delight your dear ones in Chennai. Please note: The picture is indicative. The design of the cake may vary.